In this horror sequel, a game of Ouija leads to supernatural activity. Annalise Basso, Henry Thomas, Doug Jones, and Elizabeth Reaser star. Directed by Mike Flanagan. OUIJA: ORIGIN OF EVIL OPENED IN THE U.S. ON THE 21st OF OCTOBER AND IN MALAYSIA ON THE 3rd OF NOVEMBER. TO FIND OUT WHEN IT OPENS IN A CINEMA NEAR YOU CLICK HERE. 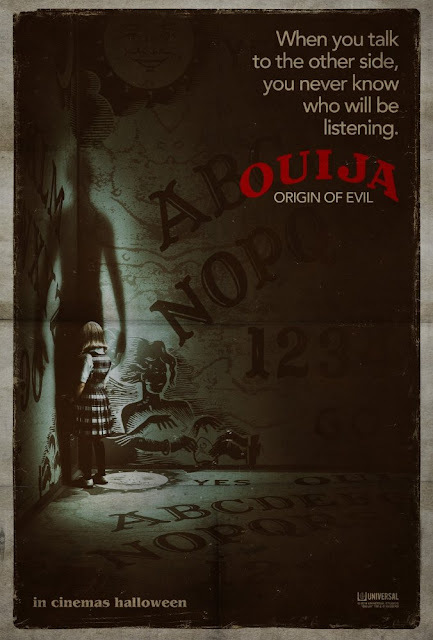 Okay, let's start off with an admission, I did not see the first movie Ouija (2014) but checking out various popular movie rating sites lets me know that it wasn't very good. So as with other situations such as this I'll be sharing my opinions without comparing it to the movie that came before it. So the Ouija board, a board with a bunch of letters and a couple of words which you would then use a planchette where you and your friends put your fingers on. Then you say some words to summon the spirits and then proceed to ask whatever questions pop into your mind, it could be about the future, your future, the afterlife, etc. Sounds like fun, right? But the Ouija board isn't something new, there's been something like it in existence throughout history, used by shamans, wisemen, soothsayers and many more. What the Ouija board is supposed to do while your fingers are on that planchette is to do what is called planchette writing or spirit-writing or also known as automatic writing. Presumably when you say those summoning words and you ask your questions a spirit will slowly move the planchette to answer yes or no or spell things out for you. All this is done without any of the participants moving the planchette themselves or putting any pressure on it. That's what the players of course believe is currently happening or should happen. But science isn't convinced that that actually happens. What they think happens is called an ideomotor response, it's when your fingers move involuntarily and in an unconscious way and the words that are spelled just happen to be whatever you may be thinking right at that moment when you asked that question. Spirit writing has been around for a long time, one of the earliest mentions of it happens to come from China from around 1100 AD from the Song Dynasty. Back then it was called Fuji, and as the Wikipedia puts it, "The use of planchette writing as an ostensible means of necromancy and communion with the spirit-world continued, and, albeit under special rituals and supervisions, was a central practice of the Quanzhen School, until it was forbidden by the Qing Dynasty." But China wasn't the only place in the world that practiced it, it is claimed that similar methods of mediumistic spirit writing have been practiced in ancient India, Greece, Rome, and medieval Europe. The Ouija board that we see in the movies and that is popular in American Culture on the other hand comes courtesy of a man named Elijah Bond who on July 1, 1890 introduced it to the American public. for a while it was just considered a silly board game by everyone until an American Spiritualist named Pearl Curran used it as a divining tool during World War I. But even before that Spiritualist used to use a similar type of board to so that the living can communicate with the dead in camps in Ohio in 1886. Now the first movie was actually considered a sequel to the movie that I'll be reviewing in this blog. In that movie, from what I've read, a bunch of teenagers decided to play with the board only to unleash a spirit that begins to kill everyone that played it. Then as the remaining survivors try to figure out what's going on they come across the history of the board that they're playing with and they discover that it has a history. A history involving a family and an unsolved case of a missing person. This movie is that history. So if you're in the U.S. and are a horror movie fan you've probably already seen it. If you haven't and like horror movies you've probably seen the trailers, right? Or read the synopsis for it by now. Anyway if you haven't it's the story of mother Alice (Elizabeth Reaser) and daughters Lina (Annalise Basso) and Doris (Lulu Wilson) and their struggle to make ends meet. Where's the husband and father? He was killed when a drunk driver drove into him. So to make ends meet Alice provides and unusual service to those who have lost a loved one, she offers to get in touch with them and help them find closure by asking only three questions. Things aren't going so well though. Then one day Lina sneaks out to hang out at a friends house and while there her friends decide to play with a Ouija Board. While playing they are caught by her friend's mother and Alice is called to pick her up. Alice of course isn't happy and Lina only excuse is that they were just hanging out and playing with the Ouija board. Lina then suggests to her mother that she should consider adding the board as part of her methods of communication. So when she goes to pick up a few supplies the next day it just so happens that the store also just happens to be carrying the board game. So now the board game is at their home and Alice is preparing it to use in her work. Now the Ouija board comes with instructions, a couple of really important ones are to never play alone and to always say goodbye. While setting up the board Alice reads of the summoning words alone and when she is done she doesn't say goodbye. While Alice does all that up stairs Doris goes into a trance and begins to answer the questions that Alice is asking downstairs. And so the scary part begins. Doris begins to behave strangely, Lina begins to experience odd things and even having nightmares, Doris begins to write in Polish. And when Lina discovers that Doris has been writing in Polish she takes those notes to Father Tom Hogan (Henry Thomas). When Father Tom has it translated he meets with Lina and Alice and tells them what Doris has written. But before he tells them what is written Father Tom decides to test Doris's abilities to talk to the dead. He isn't convinced and when he informs Alice and Lina of what Doris has written the three decide to confront Doris and what is possessing her. So here's the good and bad as I see it. A pretty cool idea to use the Ouija board I guess, it hasn't been done in a while. The story is decent and predictable but doesn't hold up very well towards the end. Some parts don't make much sense, the discovery of what is possessing Doris isn't at all original or interesting. It's a slow to build film. Slow in the beginning, better in the middle, loses steam towards the end. The casting is decent. The main character here is actually Lina and Annalise Basso does a pretty good job. Doris played by Lulu Wilson does a decent job but not all the time. She does do the creepy factor well though. The scares were okay, it's the usual stuff. Nothing new here. To be honest this movie wasn't a bad one it's just that there's nothing new or fresh or original about it. Every element in it you've seen somewhere before. Could it have been better? Maybe, maybe not. Could it have been worse? Definitely. For whatever shortcomings or failings this movie has it's still an okay horror movie. If you're looking to waste a few hours and maybe get a few scares in then there are worse options than this one. Not too sure if there are better options playing at the moment. 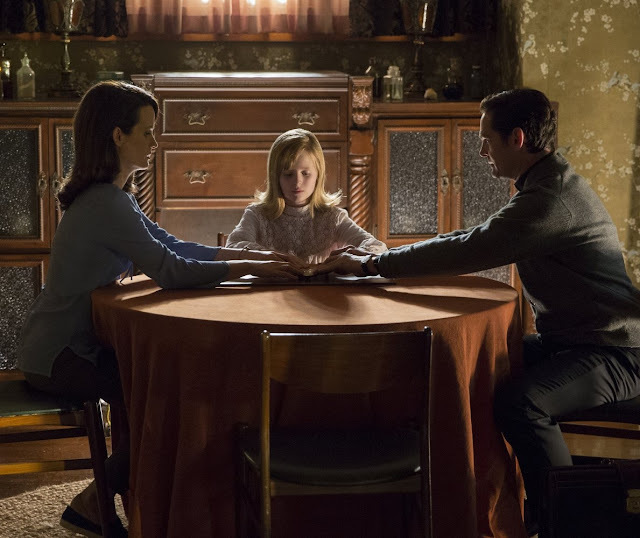 Ouija: Origin of Evil gets a 2.5 out of 5 from me. A GREAT BIG THANKS TO BFM RADIO AND UNITED INTERNATIONAL PICTURES MALAYSIA FOR THE PASSES! !